Ensure hot water for all seasons with V Hot Commercial Series of Solar Water Heaters from V-Guard. This wide array of water heaters help cut down your electricity bills and are suitable for a broad range of applications - from homes, hotels to commercial applications. 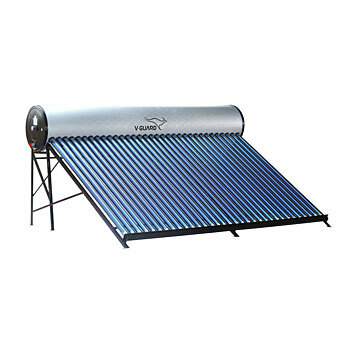 V-GuardV Hot Commercial Series Solar Water Heaters come with an evacuated tube collector system that enables an optimal utilisation of solar energy. The PUF insulated stainless steel storage tank prevents heat loss. The V-Guard V Hot Commercial Series Solar Water heaters dramatically reduce your electricity bills, help conserve energy and are environment friendly. These water heaters work on solar energy and are available in quite a few capacity options.Our natural resources are finite and that's why the use of non-conventional methods of heating water has begun. These are inexpensive, safe, reliable and are easy to maintain. More importantly, they are eco-friendly and provide trouble free service for years together. V-Guard as a brand is committed to enabling solar everywhere and bringing the power of the Sun to people in the most efficient and cost effective way possible. So cut down on your electricity bills and ensure hot water even when there is a power cut with the V-Guard's V Hot Commercial Series of Solar Water Heaters.